Trust me I have no sympathy for T.I., but this right here is totally ridiculous. The prison system messes up and T.I. is the one that has to pay the price. Interesting. Rapper T.I. 's furlough from prison was cut short last week because prison officials objected to his manager and a reality TV producer riding with him on a trip to a halfway house, according to a prison document. "Such people were not authorized to travel with him in the conditions of his furlough," a Bureau of Prisons report obtained by CNN said. "He further indicated he was discussing a new reality series and a book with those individuals." The two men whose presence was questioned by prison officials each said they and T.I. believed they were allowed to ride with him since they were on the prison's approved list of visitors. U.S. marshals removed T.I. from an Atlanta halfway house and placed him in the federal prison in Atlanta a day after his release from the Federal Correctional Center in Forrest City, Arkansas. It was initially believed prison officials objected to his use of a luxury tour bus from the trip from Arkansas to Georgia, but the furlough agreement T.I. signed only specified that he would travel in a "POV," a privately-owned vehicle. The popular hip-hop artist, whose real name is Clifford Harris, Jr., is serving an 11-month sentence for violating his parole on a gun conviction. Unless prison officials conclude he did not violate his furlough agreement, he is expected to stay locked up until that sentence is complete on September 29, documents indicated. Bureau of Prisons officials are expected to review the suspension of his furlough, but it is not known when a decision might come, defense attorney Steve Sadow said Thursday. T.I. 's manager, Brian Sher, sent a statement to prison officials explaining that he had no idea it was a violation of the furlough for him to accompany his client on the trip. "It was clear to me that Mr. Harris believed that I was permitted to be with him on the trip back to Atlanta because I had been authorized to visit him and have contact with during his time in Forrest City," Sher said. "During my time with him on the ride back to Atlanta, no business was conducted with Mr. Harris." Cris Abrego, a reality TV producer who was on the bus, wrote to prison officials that he also believed it was allowed since he "was on the authorized visitor list, and had visited with Mr. Harris a couple of times prior to his release." A book and the VH1 series, which publicists announced the day of T.I. 's release, had been negotiated months before, his entertainment attorney, Jonathan Leonard, said in another letter to prison officials. In case prison officials were miffed that their inmate was traveling in luxury, T.I. 's wife sent a letter explaining that his attorneys believed it was safer than a car because of expected media attention to his release. "We felt this could cause an accident and jeopardize our and other travelers' safety," Tameka "Tiny" Cottle-Harris wrote. "We knew we had a long trip and did not want to create an unsafe situation as we traveled so we thought it was a good idea to travel by bus." When T.I. walked out of prison on August 31, he tweeted, "The storm is over & da sun back out." He had been expected to complete the last weeks of his sentence in a community service center, or halfway house, in Atlanta. VH1 announced the reality TV show soon after he boarded his bus. 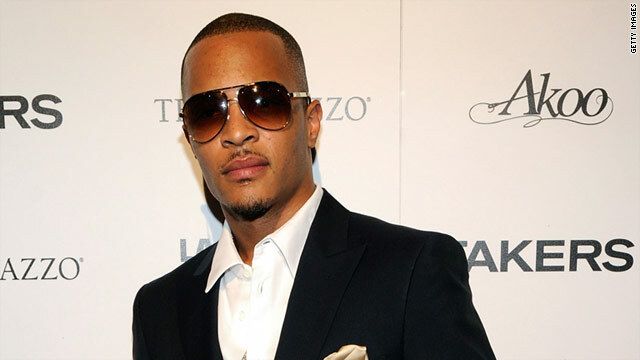 The as yet-untitled 10-episode series, which will premiere in December, will show T.I. "as he re-adjusts to life as a free man after being incarcerated for nearly a year in a federal prison in Arkansas," VH1 said. He was locked up behind the high walls of the U.S. Penitentiary in Atlanta the next afternoon. The rapper served two stints in the Arkansas prison. He served seven months there in 2009 as part of an unusual sentence negotiated two years ago to resolve federal gun charges. Those charges followed his attempt to buy three machine guns in the parking lot of an Atlanta grocery store. His latest time behind bars was triggered by his arrest, along with that of his wife, after a motorcycle officer stopped their car on Sunset Boulevard in Beverly Hills, California, a year ago.